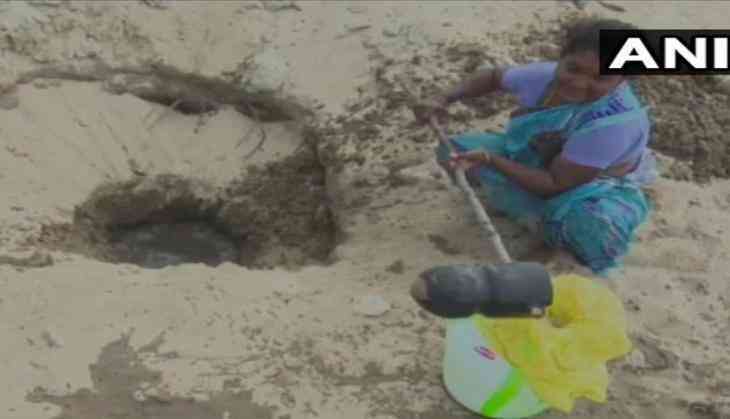 Locals residing on coastal hamlet in Tamil Nadu's Dhanushkodi town of Arichal Munai are forced to dig up sandy terrain in order to procure drinking water to meet their daily needs. Approximately 650 fishermen families live in Dhanushkodi, who have been dealing with this crisis for the past thirty years. "We have no other way to get water. This problem has been prevailing for the past 30 years. The government has not done anything as yet in this regard. It is also difficult for us to access drinking water especially during summer," a local said. "We usually have to dig up the sand and strain it through a piece of cloth when placing it in the container," the local added.